The mother earth produces membrane called atmosphere and transforms cosmic energy into life energy. The rich natural environment has produced innumerable lives, nourished them and sustained the symbiotic existence of multiple lives. The role of humanity is to pass this beautiful earth onto the next generation and to connect every life on this planet. March 11, 2011, we had the unprecedented earthquake and the nuclear accident in Fukushima. Through that tragic experience we learned that we are part of this earth. What kind of culture are we to create? Whak kind of earth are we to pass onto the future? Let us visualize a beautiful earth and pray for this star. Let us pray together for every life on this planet. When we pray we resonate with other people who pray and create power to change this reality. Your prayer will create a rainbow bridge of love and thankfulness and envelop the earth. Let us pray together at Wakamiya Hachimansya, the Nagoya Sochinjyu (the center place to pray for the Nagoya area)! 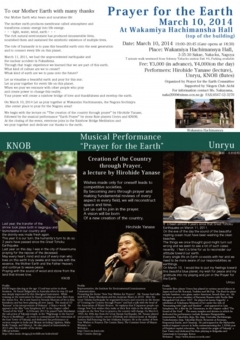 We begin with the lecture on “The creation of the country through prayer” by Hirohide Yanase, followed by the musical performance “Earth Prayer” by stone flute players Unryu and KNOB. At the closing of the event, everyone joins in the Rainbow Bridge Meditation and we pray together and dedicate our thanks to the earth. Last year, the transfer of the shrine took place both in Iseginguu and Izumotaisha in our country and the divinity was made fresh again. This year it is our turn, the humanity’s turn to do so. 3 years have passed since the Great Tohoku Earthquake. Last year on this day, I was in the city of Kesennuma praying for the repose of the deceased. May every heart, mind and soul of every man who lives on this earth truly awake and resonate with the essence, the Mother Earth and the Father Heaven, and continue to weave peace. KNOB began dancing at the age 13 and was active in show business. He found Didgeridoo in Australia when he was 25 and was deeply impressed by this Aboriginal instrument. 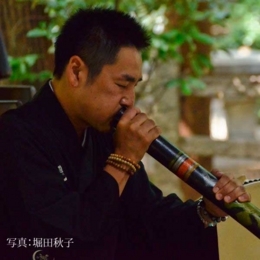 While training on the instrument he found a traditional stone flute from the Jomon Era. 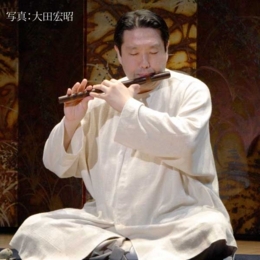 He is now based in Setsudo Museum of Art in Kita Kamakura and has been playing all over Japan. The musical CD “Kannon” is his interpretation of Hokusai’s Ukiyo-e world. He appears in the film “Gaia Symphony #6” in the chapter called “Sound of the Void”. In February 2013 he joined Taiin Murakami, the sub priest of Yakusiji temple, in the “Pilgrimage to the Sacred Places to Buddhism”, an event to commemorate the restoration of the East Tower of Yakusiji, and dedicated his performance at various temples in India and Bhutan including Gijjakuta, Maha Bodhi Temple, and Nihon-ji. He also played at Izumotaisha in 2013 after the transfer of the shrine. It’s been almost 3 years since that Great Tohoku Earthquake on March 11, 2011. On the eve of the day the sound of the beautiful rippling ocean must have been washing the clean beaches. The things we once thought good might turn out wrong and we seem to see a lot of such cases recently. I feel it is time for us to reconsider our attitude toward our earth. Every single life on Earth co-exists with her and we need to be more aware of our responsibilities as earthlings. On March 10 I would like to put my feelings toward this beautiful blue planet, my wish for peace and my gratitude into my playing and join in the Prayer for the Earth. Wishes made only for oneself leads to competitive societies. By becoming zero through prayer and making fundamental reviews of every aspect in every field, we will reconstruct space and time. Let us call to join in the prayer. Representative, the Institute for Environmental Consciousness Communication. Promoting the theme “New Year Wishes for Prayers”, Mr. Yanase had talks with Prof. Kazuo Murakami and the musician Kitaro in 2010. 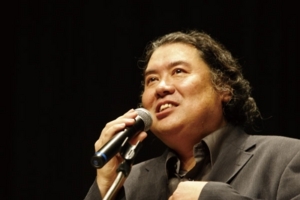 After the Great Tohoku Earthquake he organized lectures and concerts on the theme of “Creating the Country through Prayer” and had a talk with the head of the Association of Shinto Shrines. He explains that if Japanese people can change New Year wishes they make at their first visits to the shrines and temples on the New Year to prayers, the country will change. On March 6, 1995, the 49th day from the Great Hansin Earthquake, Mr. Yanase planed and produced a charity concert of Kabuki and classical music at Akasaka Suntory Hall featuring the late Ichikawa Danjuro. He is the author of New Year Wishes to Prayers, The Cosmic Diary, The Common Sense of Mayan Wisdom, etc. Praying means to transcend three dimensional thoughts and to become zero. It is to view three dimensional problems from higher dimensions and to find solutions. May every heart, mind and soul truly awake and resonate with the essence, the Mother Earth and the Father Heaven, and continue to weave peace. I would like to put my feelings toward this beautiful blue planet, my wish for peace and my gratitude into my playing and join in the Prayer for the Earth. Fukuroi-shi, Shizuoka – Institute for Integrated Medicine, Inc.
Osaka Station Bldg. 5th Fl. The act of praying begins with feeling every human being on the earth. It is feeling every plant, insect, animal, mountain and sea. It is feeling every life on this planet. The human-centered consciousness transforms and evolves - it is a process of transformation of human consciousness. 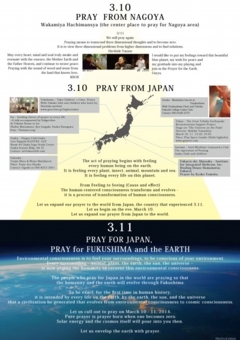 Let us expand our prayer to the world from Japan, the country that experienced 3.11. Let us begin on the eve, March 10. Let us expand our prayer from Japan to the world. to be conscious of your environment. Every surrounding - animal, plant, the earth, the sun, the universe – is now urging the humanity to recover this environmental consciousness. The people who pray for Japan in the world are praying so that the humanity and the earth will evolve through Fukushima. To be exact, for the first time in human history, it is intended by every life on the earth, by the earth, the sun, and the universe that a civilization be generated that evolves from environmental consciousness to cosmic consciousness. Let us call out to pray on March 10 - 11, 2014. Pure prayer is prayer born when one becomes zero. Solar energy and the cosmos itself will pour into you then. Let us envelop the earth with prayer. 祈りのくに since 2011-08-14 / Copyright 2011 環境意識コミュニケーション研究所. All Rights Reserved.